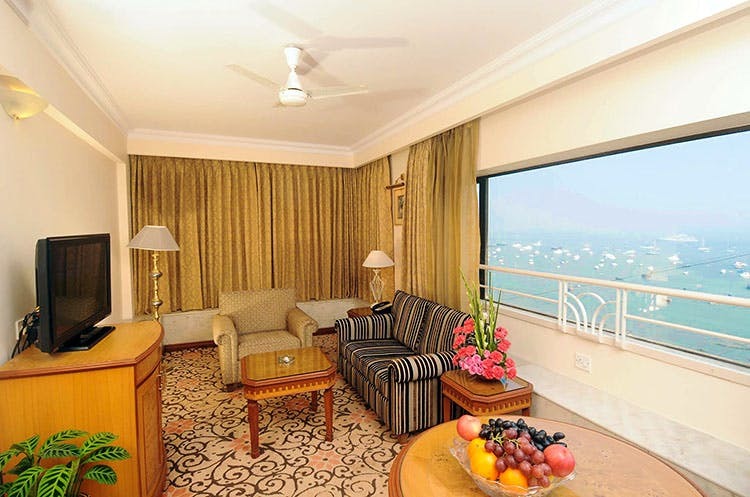 Nestled amidst the heart of South Mumbai, Fariyas Hotel offers you a view of Mumbai harbour, right in Colaba. It’s perfect for a sea-view staycation that’s romantic and convenient (shopping, food, Insta-friendly all in one go!). If you haven’t been there yet, then here’s what you’re missing out on. Just a five-minute drive from the Gateway of India and Prince Of Wales museum, Fariyas Hotel has a swimming pool and a lot of amenities that can make for the perfect holiday in the city. With floor-to-ceiling windows that give you the best view, to even bath tubs in the rooms, there’s so much to look forward to. You also have a gym, a sauna room, a pool-side cafe and Tamarind restaurant inside the premises to satiate your taste buds. They have four room options – superior rooms, deluxe rooms, executive club rooms and their suite (price ranges from INR 8,250 for the superior room to INR 14,225 for the suite). What we really love is the close proximity to olde Bombay’s iconic landmarks, a sea-view and enough and more activities to keep you entertained. Take a break from your hectic work schedules and head here for a well-deserved break. This hotel offers you some really interesting options to enjoy your stay and even the surrounding vicinity. Make the most of town now! They also have a Fariyas Hotel in Lonavala, which is another great option if you’re planning a mini getaway. Try booking from other travel websites for some interesting deals and discounts.